On. 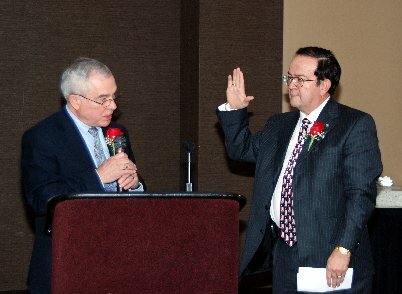 Jan. 16, 2013, TMA President Michael E. Speer, MD, traveled to El Paso to swear in Patricio Pazmino, MD, as the new president of the El Paso County Medical Society. Dr. Pazmino took over after the year-long term of Richard M. Applebaum, MD. Below are Dr. Speer's comments to the assembled audience. Thank you Dr. Applebaum … and let me be the first to congratulate Dr. Pazmino and wish him well. You are taking over the reins of a proud, 115-year-old organization of physicians. Just as the Texas Medical Association does statewide, the El Paso County Medical Society stands tall for its physicians and your patients, advocating for better health care for the people of El Paso. We do this well not only because of the energy and commitment of leaders like Dr. Applebaum and Dr. Pazmino, but also because of the legions of superb physicians who stand with us. Your Society represents your 1,090 members admirably. I like to believe that TMA represents all 47,000 members equally as well. But think how much more we could do if the El Paso County Medical Society counted 12 … or 13 … or 14 hundred members. Think how much more we could do if the TMA counted 48 … or 49 … or 50,000 members. If each of you were to leave here and … tomorrow morning … try to recruit a non-member colleague, what would you say? What is your sales pitch to convince them to join TMA and the El Paso County Medical Society? I think it’s pretty obvious. For example, thanks to the hard work of El Paso physicians like Manny Alvarez and Manny Acosta and your Executive Director Patsy Slaughter, you’ve built the Border Health Caucus into a powerful force in Austin and Washington, DC. For example, you’ve made the Paul L. Foster School of Medicine a reality, right here on the border. For example, we’ve reversed part of the disastrous cut in payments for dual-eligible patients. … And we are determined to overturn the rest of it in the Texas legislative session that began last week. For example, we understand that Medicaid – which covers such a huge share of the population here in El Paso – is badly broken. El Paso doctors like Gil Handel and David Palafox and Jose Burgos and Maureen Francis served on TMA’s Physicians Medicaid Congress to help us find ways to make that broken system work again for you and your patients. The Congress’ long list of excellent recommendations will come before the TMA Board of Trustees in two weeks. For example, TMA and the Border Caucus and the El Paso County Medical Society have already delivered a strong message to a legislature that needs to listen. Physicians … we said … are critical to a cost-effective health care system in Texas. Otherwise, the state’s efforts to increase preventive care … to improve medically necessary treatment for the chronically ill … to reduce inappropriate emergency department visits … will fail. We are attempting to impress on state leaders that cutting physicians’ Medicaid and CHIP payments is not an effective tool for controlling health care costs. That … quite the contrary … it exacerbates the cost of care. We are asking them to ensure Texans of all income levels have access to preventive, routine, and emergent care. We are asking them to ensure competitive Medicaid and CHIP payments for physicians. We are asking them to increase funding for cost-effective, community-based mental health care and substance abuse. And lastly, “Remember Tort Reform!” That great law you helped to create has resulted in every physician in this state paying one-third to one-half less every year in liability premiums compared to 2003. That is just a small portion of what … together … we’ve done and we are doing. But I think it’s plenty to convince more El Paso physicians to join us. And I urge you to try it out.